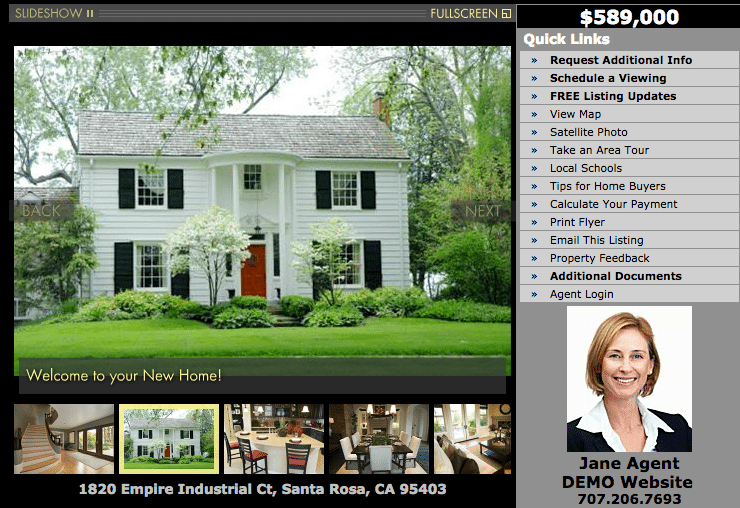 It’s valuable to offer a Web page that features everything a potential buyer should know about a listing. However, if a property is registered under its own domain — that is, “1313MockingbirdLane.com” — it does little for the online popularity of its parent website. In fact, it detracts from it. Other than your name, logo and contact information, you might as well be pushing customers to Inman.com. Point is, it’s better from an SEO standpoint, as well as for several other reasons, to have the capability to build individual listing pages under your own domain. Nevertheless, I spent some time checking out ListingDomains.com. If you’re going to pay for a website, your first priority should be including a tool that allows you to build your own listing pages. For some reason, the real estate industry has grown to rely on a bevy of third-party services like ListingDomains.com to build single-listing websites. This has fascinated me for years. I know sellers may be enamored with the idea of a single-listing site, but clients are not agreeing to list with a URL — they’re listing with you, your brand promise as a real estate agent. Isn’t that why you create big signs with your logo and choose to affiliate with national brands? Isn’t that why you spend thousands on CRMs and apps and email marketing and expensive headshots? If your brand matters so much, you should do all you can to keep people in front of it. And intrinsic to that should be a website that pulls in leads and keeps them there, a site that has its own tools to build compelling listing pages. Listing pages provide your site with relevant, valuable content. You lose all of that value when you choose to put it all on individual domains unrelated to your business. Yes, a single-listing site built with ListingDomains.com will have your name and contact information on it so clicks or calls may come back your way, but why send someone to your back door when you paid for all that curb appeal? Furthermore, when you have 10 listings, that’s 11 different sites to manage, including your own. All of that great real estate content, all of it evidence that you’re a terrific listing agent, sitting on its own out there in the Internet, without a parent site. Websites should be built around the user experience using deliberate strategies to get visitors to read your content, share it and, most importantly, take interest in the homes you’re selling. Why invest in any of that if your intent is to send them somewhere else to see your product? 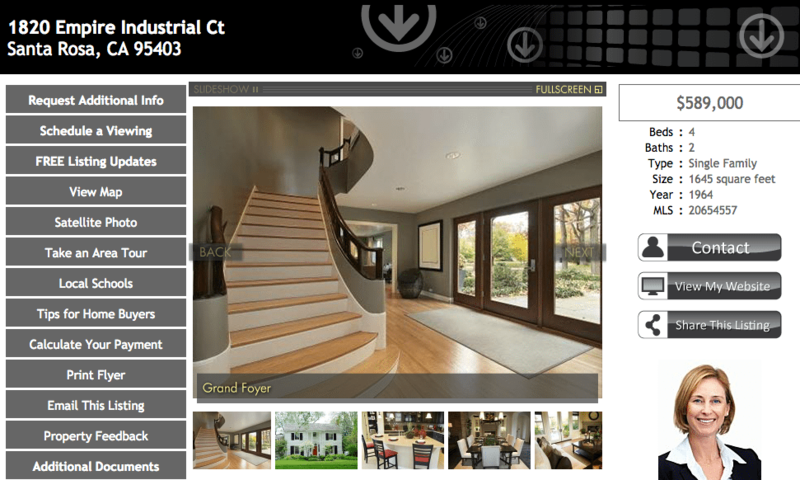 Every agent seems to have an IDX feed so folks can search everyone else’s listings. Yet, you send them somewhere else to view your own? Strange. ListingDomains.com is functionally fine. It’ll do what you need it to do. The websites are visually lacking but, I suppose, highly informative, and your $50 single-site fee gives you a lot of marketing features. You can have a ton of pictures, upload documents and send the link all over the place. You can choose to leverage ListingDomains.com’s Facebook app that will present all of your listings on your page, its “video” builder (not a video) that creates a music-backed photo slideshow of a listing’s highlights, or its free sample site tool for listing presentations. 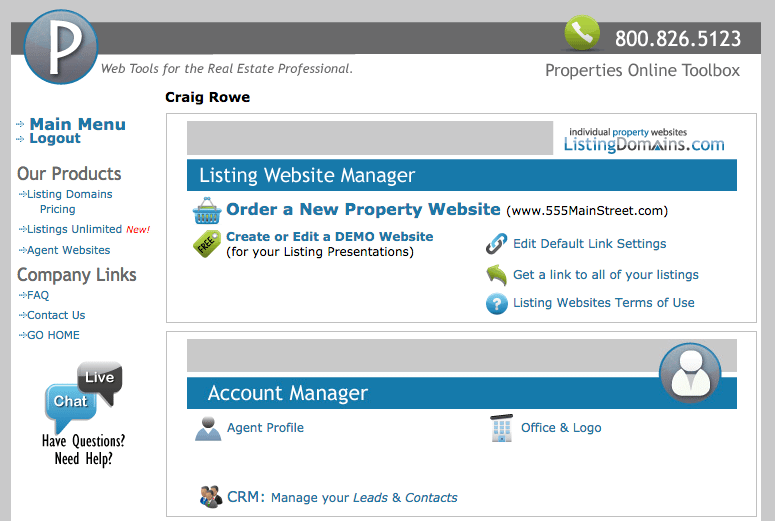 ListingDomains.com thinks that CRM stands for “contact relationship manager,” so it sells customers the ability to see who has completed the capture forms on your listing site. You can log in to review recent submissions and export them to a number of other formats and tools. Please, don’t think this is an actual customer relationship management (CRM) solution. This is a very weak upsell at best. For small upgrade fees, agents can have a text code that will return a property’s details to an interested party, as well as a listing sign rider with the property’s domain name. I think the text marketing feature is worthwhile, although I’m not a huge fan of the rider signs for reasons to which I already not so subtly alluded. ListingDomains.com has a seemingly exhaustive list of “value-adds” that I view as dated and tedious. It offers a CD-archiving service, audio tracks that auto-play upon site loading (#makeitstop), mortgage calculators, an email announcement to area agents, professionally printed postcards (Is there a black market of unprofessional postcard printers out there?) 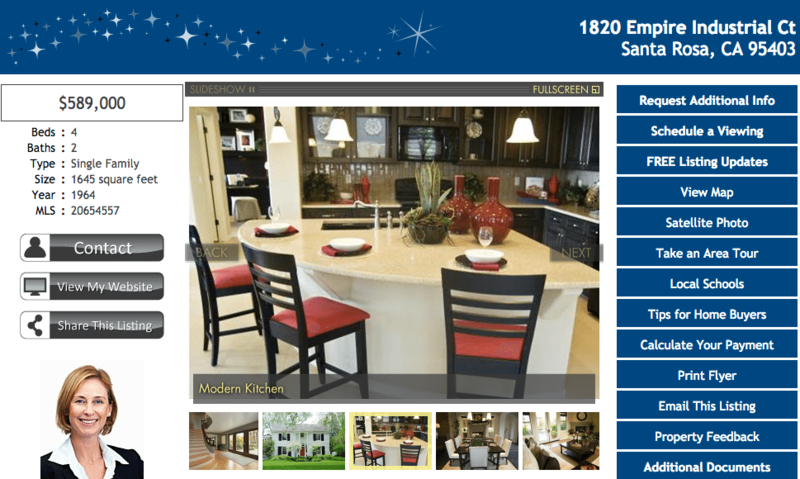 and even Craigslist-friendly listing pages. I’m always anxious about technology solutions that want to be all things to all users, especially in the context of marketing. Just having a bunch of weapons at your disposal doesn’t mean you’re ready for war. There’s nothing surgical about this strike. The back-end design demonstrates a lack of interest in user engagement. I imagine the intent is to make ListingDomains.com a daily login; however, it has a long way to go to keep me logged in. ListingDomains.com also creates QR codes for your listings. There isn’t much to say about ListingDomains.com. I wouldn’t use it for anything other than creating single-listing websites, if that’s an online marketing strategy you choose to employ. It’s highly affordable and has a lot of the tools you need to get a listing into the real estate wilds of the Internet — it just doesn’t come with a manual for learning how to cohesively use all those tools. Do you use ListingDomains.com? What do you think? Leave a comment and let us know!